It is Opening Day here in the Twin Cities, although Opening Night is more like it. 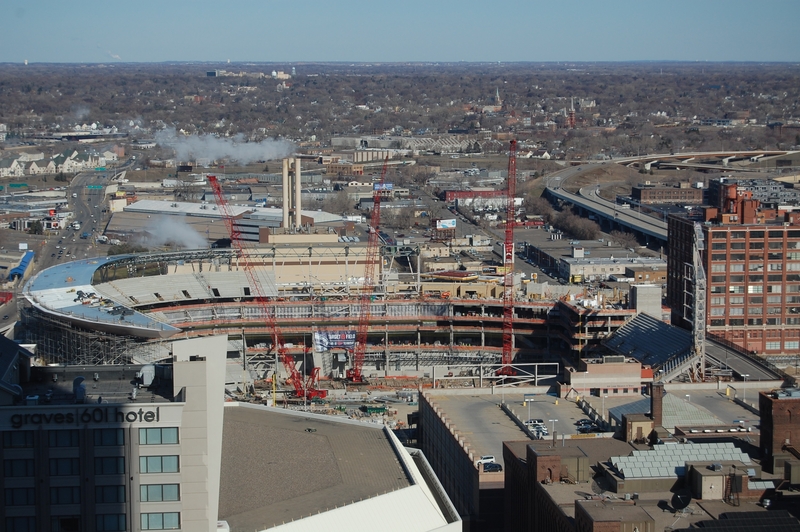 As you can see from the above picture, taken from my really high hotel room, the Twins’ new, outdoor stadium is moving right along. It is supposed to be finished well before the Twins open the 2010 season. Not that cold weather is a bad thing, but I just came back from a brisk little walk to and from Target (also the name of the new ballyard) to pick up some things. It is very sunny, but my bottom teeth were colliding with my upper teeth. Yes, it is a little chilly here and I can only imagine what it will be like next season when the Twins open their new facility sometime in April. It figures to be a wonderful facility when it is finished and I’m looking forward to seeing my first game there. In the meantime, the Metrodome will be packed and warm for tonight’s regular season opener between the Mariners and Twins. It will be the first time left fielder Endy Chavez has played here and he practiced a lot on catching fly balls during yesterday’s workout. The teflon roof happens to be about the same color as a baseball so total concentration is necessary and sometimes even that isn’t enough. It is worse during a day game with a cloudless sky. Maybe it will be cloudy for Thursday afternoon’s series finale. My most vivid memory of the Metrodome — other than the incredible noise made by the fans during the 1991 World Series — was being in the press box covering the Athletics when Dave Kingman hit a towering popup straight up. The ball went up, up, up — and never came down. It amazingly went into one of the holes in the roof. The Twins catcher and infielders covered their heads with their gloves, not wanting to get hit by a ball they couldn’t see. The ball was found the following day and as part of the pre-game festivities, was dropped from the roof. Can’t remember if it was actually caught. Another memory is watching a ball Mark Whiten hit fly, fly away so far that it reached the wall above the football press box in right field, slamming against a curtain that covers the outer wall of the place. I guessed the ball must have traveled at least 500 feet, and I had good eyes back then. Got off to a bad start yesterday during the workout. Working on just a few hours of sleep because of my early flight from Las Vegas, On my way to the press box following manager Don Wakamatsu’s pre-workout media session, Outside the visiting clubhouse I asked the clubhouse attendant if there was any coffee available. He said he had just dumped it out. He went one way, I thought, and I went the other. I walked into the clubhouse to ask for a Diet Coke to sip on while I wrote my stories in the press box — there was nothing available up there except some electricity for my computer, thank goodness. As I started to say, in a kidding way, to another clubhouse attendant, ‘so you dumped the coffee…would it be possible to get a Diet Coke?’…the dude I had just talked to walked through the door behind me and chastised me for “not believing him.” Yikes! Perhaps the hospitality will be better in the new stadium.